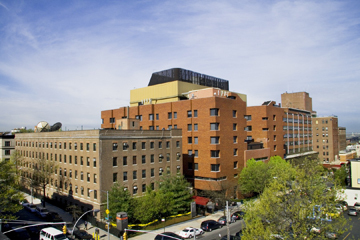 NewYork-Presbyterian Brooklyn Methodist Hospital is located between Seventh and Eighth Avenues, on Sixth Street, in Park Slope, Brooklyn. Parking is available in the Hospital's parking garage, which can be entered from Sixth Street (going West). The closest and most direct subway route to NewYork-Presbyterian Brooklyn Methodist Hospital is the "F" or "G" train. Take the "F" or "G" train (toward Coney Island/Stillwell Avenue for the "F" or toward Church Avenue for the "G") to the Seventh Avenue station in Brooklyn. Exit the station at either the Seventh or Eighth Avenue end of the platform and then walk to Sixth Street. the "D," "N," or "R" train at the Ninth Street/Fourth Avenue station. the "A" or "C" train at the Jay Street/Borough Hall station. the "A" or "C" train at the Hoyt Street/Schermerhorn Street station. Take the Jackie Robinson Parkway (formerly known as the Interboro Parkway) westbound to Exit 1, Bushwick Ave. Follow the exit ramp and bear right at the traffic light onto Bushwick Avenue for two more traffic lights. Turn left onto Eastern Parkway. Remain on Eastern Parkway all the way to the end (approximately seven miles) to Grand Army Plaza. Enter and go around the traffic circle, in the extreme left lane, following the signs to Prospect Park West. Proceed into the right two lanes and onto Prospect Park West, continuing for nine blocks to Sixth Street. Turn right onto Sixth Street - the Hospital is two blocks, directly ahead, with the parking garage on the right hand side, just before you get to Seventh Avenue. Take the George Washington Bridge over the Hudson River into Manhattan. Get off at Exit 2, Harlem River Drive. Merge onto the Harlem River Drive, which becomes the FDR Drive. Continue on the FDR Drive all the way to the Brooklyn Bridge (Exit 2). Follow the directions for the Brooklyn Bridge below. Take the Lincoln Tunnel or the Holland Tunnel to the West Side Highway in Manhattan. Take the West Side Highway to the Brooklyn Battery Tunnel and then follow the directions for the Brooklyn Battery Tunnel below. After crossing the bridge, continue straight ahead down Adams Street all the way to Atlantic Avenue. Turn left on Atlantic Avenue and proceed to Third Avenue. Turn right on Third Avenue and drive about a mile to Ninth Street. Turn left on Ninth Street and drive five blocks to Eighth Avenue. Turn left on Eighth Avenue and make another left onto Sixth Street. After leaving the tunnel, take the Brooklyn-Queens Expressway south, exiting left onto the Prospect Expressway. Then follow the directions for Staten Island given below. Please note, however, that the exit from the southbound BQE onto the Prospect Expressway is closed before 11:00 AM on weekdays due to the northbound HOV lane. In this case, leave the BQE at the Hamilton Avenue exit (Exit 26). Continue along Hamilton Avenue, and cross over the Hamilton Avenue Bridge. Take the first left (14th Street) after going over the bridge. Follow 14th Street about seven blocks to Eighth Avenue. Turn left and proceed down Eighth Avenue for eight blocks to Sixth Street. Make a left on Sixth Street. Take the Brooklyn-Queens Expressway north, exiting right onto the Prospect Expressway. From the Prospect Expressway, exit at Tenth/Eleventh Avenue. At the top of the ramp, make a right turn and drive one block to the traffic light. Turn right onto Twentieth Street and continue two blocks to Eighth Avenue. Turn right again and proceed down Eighth Avenue for fourteen blocks to Sixth Street. Turn left on Sixth Street. Parking is available in the garage directly across from the Hospital on 6th Street, on the right hand side, just before you reach Seventh Avenue. Parking is available 24 hours per day, seven days per week. Parking rates range from $11 for one hour to $42 for 24 hours. A $10 additional charge is added for oversize vehicles like vans and SUVs. The Hospital's Emergency Entrance (for walk-in patients) is located on the southeast side of Seventh Avenue at Sixth Street. Clinic and Emergency Room patients can be dropped off there and can proceed to the emergency room or clinics using the wheel-chair accessible ramp or the stairs.